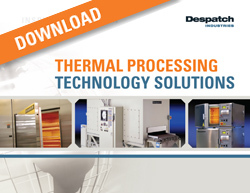 The Despatch PCO2-14™ electrically heated oven was designed to meet the specific process requirements for hard baking polyimide coatings in an inert atmosphere. 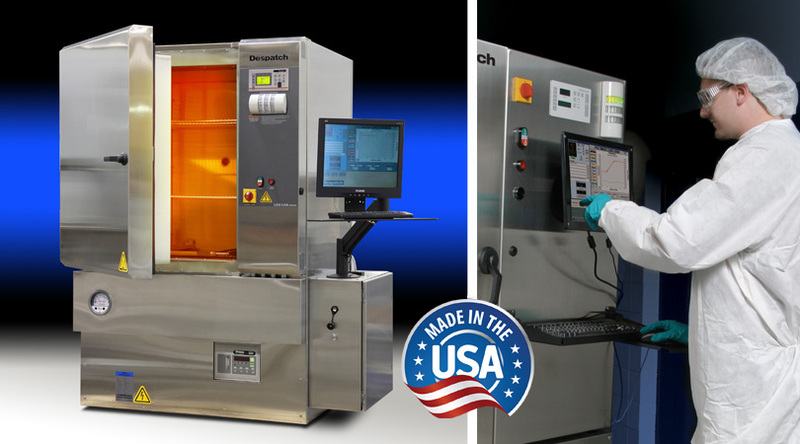 This high-performance, clean process oven (ISO Class 5/Class 100 recirculated airflow) offers many unique components, including a pressure relief system, an oxygen control system and a process monitoring system which allows the oven to achieve the strict oxygen level and atmospheric requirements involved in polyimide curing. In the "hard bake" polyimide cure process, residual solvent is removed and desired surface properties are. finalized. The process of removing solvents requires that the oven contain equipment to help prevent and collect solvent condensation. Despatch designed the PCO2-14™ with a pressure relief system that includes a removable "cold trap", an easy-to-clean condensate trap that helps to prevent polyimide buildup in the oven's exhaust. The PCO2-14™ is an inert atmosphere oven which allows the oxygen level to be maintained at 20ppm or less to help prevent oxidation of the polyimides being cured. The oven contains an O2 monitor which is wired to the purge valve and turns the nitrogen purge on whenever the oxygen level is above the O2 monitor set point. Once the nitrogen purge is complete, the O2 level is maintained at a set point by a controller that operates a modulating valve during the curing process. This process minimizes the nitrogen usage and allows for consistent and repeatable product curing. The oven's PC features Protocol 3™ software to allow for communication between the PC and the oven, an Ethernet connection and a 15in (38.1cm) . flat panel display screen. . The Protocol 3™ software communicates directly with the oven's Protocol 3™ controller, O2 controller, O2 monitor and integrated PC to observe and data log entire cycles and provide the user with realtime information on set points, actual chamber temperatures and O2 levels throughout the entire process.